Despite the lashings of rain punishing my bedroom windows, the air was too laden with moisture to sleep with even the slightest covering of thread. And although I do not like to slumber in only my unmentionables without a sheet to offer some modesty, I had to neatly push it aside, unlike my husband who preferred to violently kick his covers off and force them to the end of the bed in a tangled mess. We are certainly opposites when it comes to sleeping styles. I barely move once I find a comfortable position, normally curled up on my left, and stay put without emitting even a peep, my beloved, on the other hand, thrashes about wildly for a good half hour or so before passing out in the most visually uncomfortable looking positions whilst muttering all sorts of nonsensical jargon with the occasional arm going rogue and whacking the headboard, or sometimes even my face...but onto my point. On sticky, humid nights I find I wake up worse for wear and that the days seems to weigh me down with their heavy air leaving me with a sheen of glistening sweat that never seems to evaporate. Once the evening shade is drawn and our tummies yearn for their last meal I can barely muster enough energy to think about what to make, let alone making it. It's nights like these you want something, quick, light and easy. So thank God for recipes like this one. Preheat the oven to 220°C. Line a tray with baking paper. Place the puff pastry on the prepared tray and prick all over using a fork. Place in the freezer until ready to use. Place a baking sheet or a pizza stone in the oven to heat. Add zucchini, onion and peas to a bowl, and season with black pepper. Remove the pastry from the freezer and divide the zucchini mixture between pastry rectangles, leaving a 1cm border, then top with pieces of feta. Remove the baking sheet from the oven and transfer the baking paper with the tarts to the hot baking sheet. Bake the tarts for 15-18 minutes until the pastry base is crisp and sides are golden brown. Scatter with mint and drizzle with a little olive oil. prep time: 5mins. I did not include the eggwhite from the original recipe, it wasn't necessary. taste: 4/5 - the perfect light dinner on a Spring evening. On nights when the air humidly clings to me like a toddler wanting attention, slaving away over a volcanic stove becomes something to dread. But what to do when your tummy is grumbling and you can't spend another night eating take out? This recipe is the solution. I spent all of five minutes tossing the veggies into a bowl (yes, I used frozen peas) before sprinkling them onto a sheet of puff pastry and then popping it into the oven. Before the commercial break came they were already gloriously puffed and the cheese just beginning to liquefy and singe. Despite the ridiculously short amount of prep and cooking time, these babies weren't short on taste. If I was to take a bite out of Spring I'm pretty sure this is what it would taste like. The vibrant mint, sweet peas and cool zucchini gave the dish a wonderful freshness and vitality and paired beautifully with the creamy, tangy goat's cheese (I always use this Meredith Dairy Marinated goat's cheese in case you were wondering, and no, I am in no way affiliated with them, I just love me some of their cheese :) and the crunchy savoury pastry. I have made these twice in the last two weeks alone when the weather has steamed up my kitchen more than the car Jack and Rose were getting busy in. would I make it again: Yes - already have. I so know what you mean about feeling weighed down after a humid night. This tart looks perfectly delicious - and perfect for such evenings. Meredith Dairy Goats Cheese is pure heaven. The pops of green in that tart are just fabulous - sounds amazing! oh my! this is such a gorgeous tart. love such fresh ingredients on it. This looks like the epitome of Spring - fresh, vibrant, zingy, gorgeous! Despite my unabashed love for summer, I do hate the hot and sticky nights. Particularly as, like you, I tend to need something covering me to sleep! you've picked three of my favorite green foods to put atop your tarts [although if the feta's green, i'll pass on it... :)]. good stuff! I cannot believe how absolutely gorgeous these colors are! Lovely tarts for sure :). Frozen puff pastry is one of life's little pleasures...so much you can do with it! 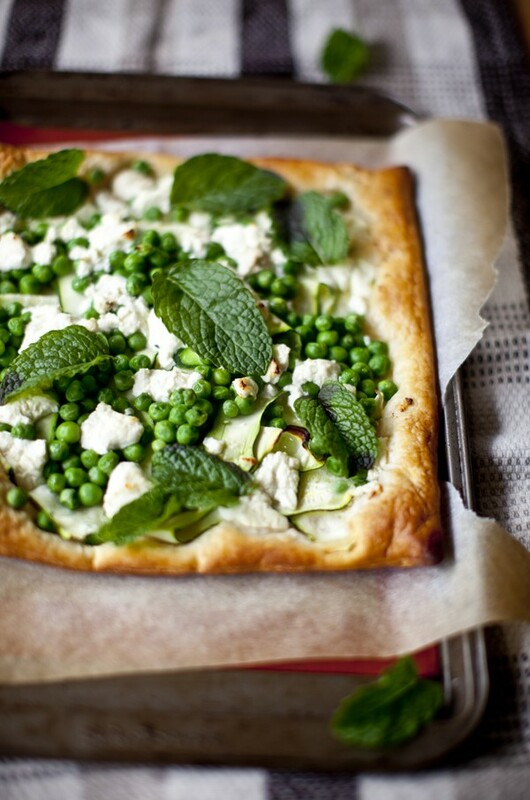 I really love your tart and find the mint addition perfect with the peas! The picture on top is stunning... it looks so beautiful in it's simplicity. THere are definitely days when I dont have time to cook and take out is just NOT an option (how much take away Chinese can one eat?! :)) This is a great idea. This tart has all my favorite things!l LOVELY! gosh, it sounds like you and your husband have the exact same sleeping habits as me and Daz. Except Daz has a tendency to do strange things in his sleep......like eat. I tried this last night and it was amazing! The trick is to add some homemade mozzarella, Ive become kinda obsessed with this recipe, I really think Im addicted to cheese! Love the recipe minus the peas, just not a fan of peas, but think it will still be an awesome dinner option, thanks. What beautiful colors. Hard to imagine being too steamy for cooking. It's so cold at our house that I'm trying to find a way to work slow cooking and turning the oven on for a period of time, into every single day. Bitter chilly!